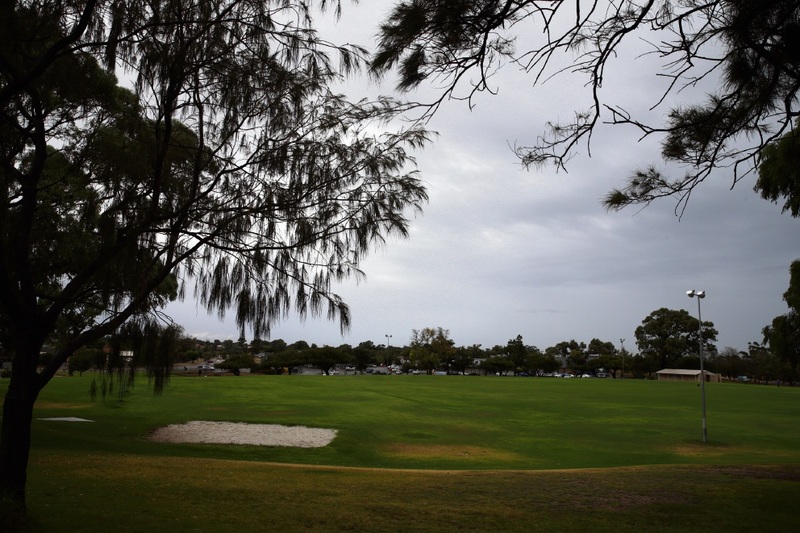 JOONDALUP United Football Club’s fight to find a home ground continues, with the City of Joondalup now considering Beldon Park – an option that has already raised hackles. In much the same way that the proposal to make Warrandyte Park in Craigie the club’s home was met with outrage by the local community last year, Beldon residents have banded together against the Beldon Park proposition. 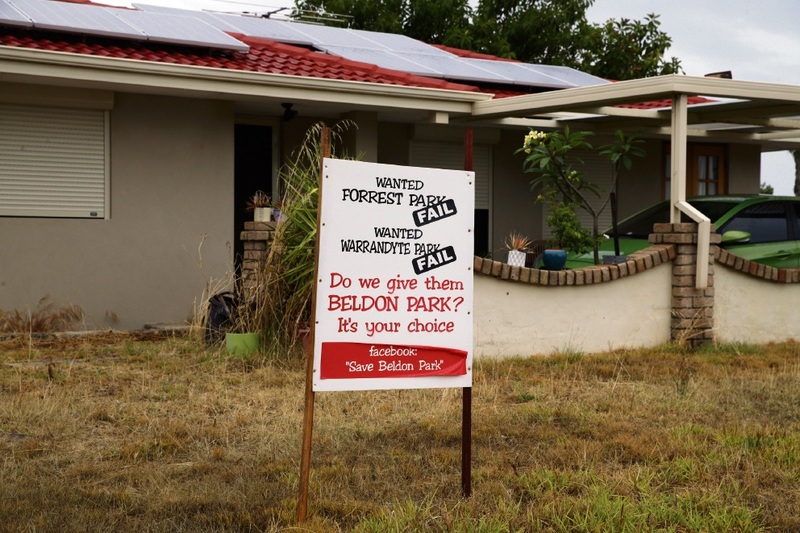 A Facebook group, Save Beldon Park, has already pulled in more than 600 members. 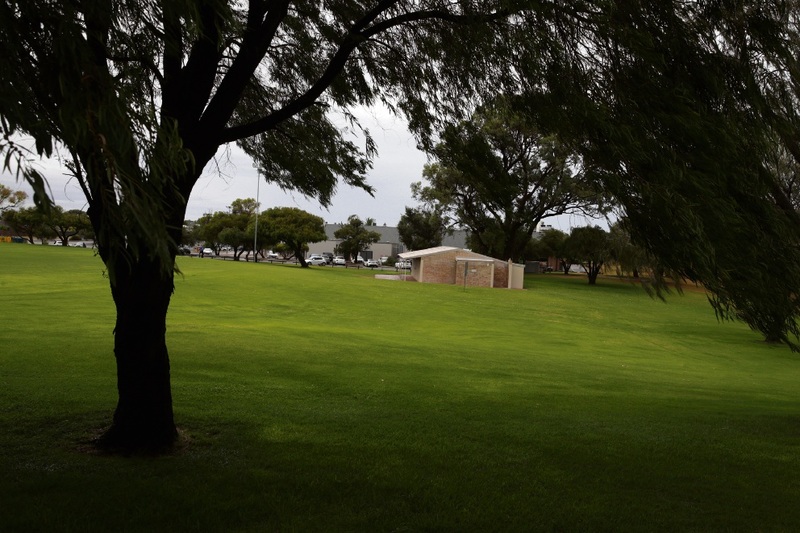 The senior and junior soccer club has operated at Beldon Park since 2012, as well as using Forrest Park in Padbury and Charonia Reserve in Mullaloo. Last year, the club won the State League, elevating three of its teams to the National Premier Leagues (NPL) WA for the 2017 season. However, in order for the club to compete at that level, it requires a fenced-off pitch with the playing field at least 60m wide and the fence about 1m high, at least 24m of linear sponsorship signage, permanent seating for at least 120 people, a scoreboard and PA system, changerooms for teams and officials, public toilets, a place to sell food and drinks including alcohol and sufficient parking. For this season, Joondalup United will play its NPL games at Percy Doyle Reserve and continue to train at its three venues while the City and the club work together to find a suitable home ground. Upgrades of Forrest Park and Warrandyte Park in Craigie have both been considered but strong community opposition meant the plans did not proceed. 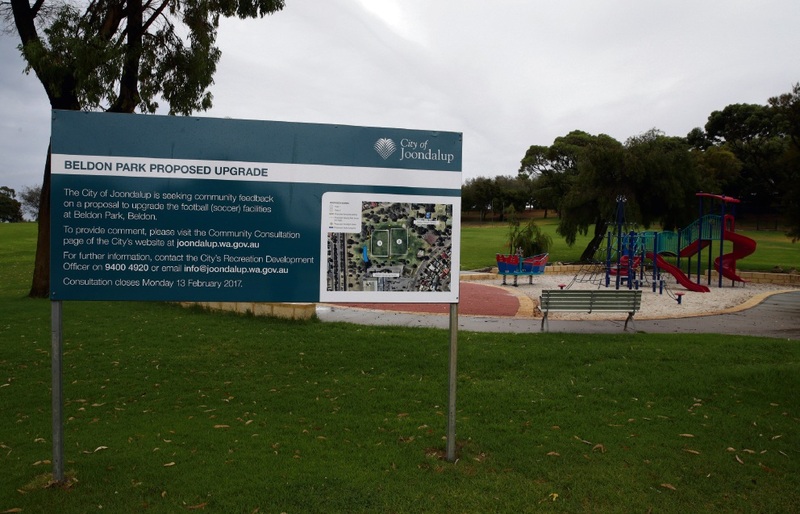 At the City of Joondalup’s December council meeting, councillors earmarked Beldon Park as the next preferred site. The City is now calling for public feedback on the proposed park upgrades, which include levelling the playing surfaces and installing a second soccer field, fencing up to 1m high around one of the fields with gates to enable public access, limestone retaining that will also act as seating, new sports floodlighting and redevelopment of the existing changeroom and toilet facility. 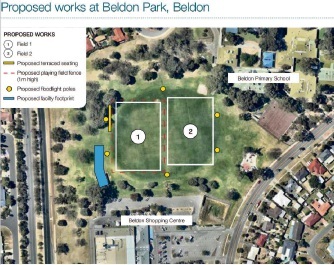 “Over a number of years, Joondalup United has operated across four different venues including Beldon Park,” the City’s website said. “This proposal will allow the club to consolidate its operations into one primary location while meeting the requirements of Football West’s NPL competition. Save Beldon Park spokeswoman Dawn Conlin, who lives within 200m of the park, said many local residents had concerns. “If it goes ahead, the park will no longer be a local community park,” she said. “It will be levelled and trees will be chopped down to turn it into a soccer stadium. “There will be little green space left. She said the residents felt they did not have enough information. “We haven’t been told what size the pitches will be or how much of the park will be destroyed or how many trees we’ll lose,” she said. “There’s no cost and no mention of who will foot the bill. “Joondalup ratepayers will be paying for people outside of the Joondalup community to play on our park. She also raised other concerns including insufficient car parking available, the park’s location between Beldon Shopping Centre and Beldon Primary School and Education Support Centre, the sale of liquor near a playground for children and litter. Last year, Joondalup United used Beldon Park on Tuesdays, Wednesdays and Thursdays from 6.30pm to 8pm and Sundays between 1pm and 5pm. However, if the proposal goes ahead, it is expected this would increase with juniors and seniors training on weeknights, regular games on Sundays and between 11 and 13 NPL games on Saturday afternoons in winter. No other sporting clubs book Beldon Park but an agreement with the Department of Education grants Beldon Primary School use between 8am and 4pm on school days. A City response to the Times said “should the upgrade proceed, as the only sporting club currently utilising the Beldon Park facility, no other clubs or groups will be affected”. It also said there were no design or concept plans at that stage so an estimated cost of works or possible tree removal was not yet known. “It is the City’s approach that any trees removed in a proposed upgrade would be replaced by additional trees and could be a feature of proposed terraced seating,” it said. Joondalup United has had a liquor licence for Beldon Park since it started using the facility in 2012 following its merge with Beldon Thistle Football Club. During this time, the City has not received any complaints, nor has it received any complaints regarding Joondalup United at any of its facilities. Joondalup United committee member Neil Sherwin said the club had also never received a complaint. “We have had no issue with obtaining a liquor licence during that time, which is evidence of our exemplary behaviour and there is nothing to suggest this would change in the future,” he said. “Concerns regarding alcohol consumption are understandable, however the fact a licence has been held for a number of years with no reported incidents is testament to how seriously the club takes the responsible sale and service. Mr Sherwin said the club had been looking for a home ground for eight years. “Football is the number one participation sport in Australia and Joondalup United provides a safe and fun environment for people of all ages, from pre-school kids right up to adults in their 60s and 70s,” he said. “However, the sport still lags behind the likes of Aussie Rules when it comes to facilities. “The club simply wants its ambitions matched so that our growth and success can continue. He said an upgrade of Beldon Park would also benefit the surrounding community. “The existing toilet block is in need of an upgrade; I think that is something all parties can agree on,” he said. “The club would also be keen to see a water fountain or two installed, as the only free water option available to the general public at the moment is from the taps in the toilet block. Mrs Conlin said residents had been distributing flyers to inform others of their concerns, placing protest signs in their front yards, writing to the City and local politicians and organising a petition. There will also be a community meeting from 6pm to 7.30pm this Wednesday in the undercover area at Beldon Primary School. Joondalup MLA Jan Norberger, who helped organise the meeting, said it would be an opportunity for Mayor Troy Pickard and the councillors to address the residents and for residents to ask questions before the end of the community consultation period. Community consultation closes on February 13. Submissions can be made at www.joondalup.wa.gov.au. Labor candidate for Joondalup Emily Hamilton has also set up an online petition to help residents opposed to the proposed Beldon Park upgrades. See the petition at www.change.org/p/city-of-joondalup-council-save-beldon-park. The Joondalup council will receive a report, including results of the community consultation, at its meeting on March 21 when it will consider the proposed upgrades.